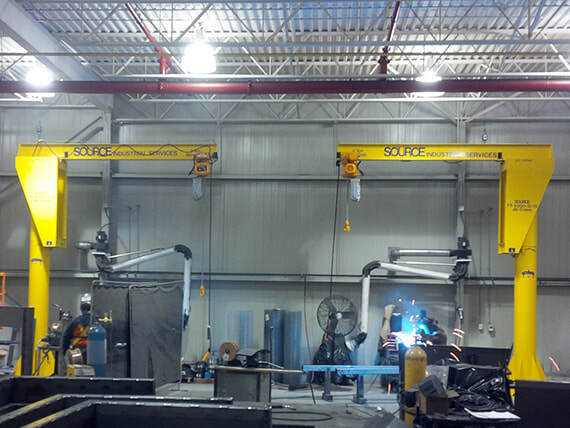 Source Industrial Service and Cranes - Top Rated Overhead Bridge Crane Manufacturing and Service Company Specializing in Material Handling Equipment, Gantry Cranes, Jib Cranes, Wire Rope Hoists, Chain Hoists, Crane Service, Safety Training, Lifting Devices, Transfer Carts, and Much More. Source Industrial is a proud Canadian manufacturing and service company. 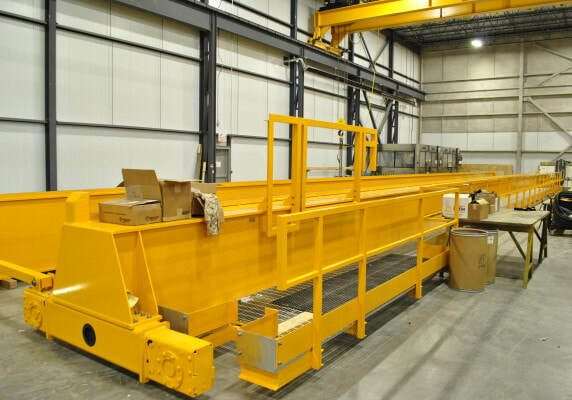 We manufacture and service all sizes and capacities of overhead bridge cranes, full or semi gantries, under hook attachments, wire rope hoists, transfer carts, chain hoists, and much more. Our knowledgable team can also provide you with non-destructive testing services and all types of crane and forklift safety training. Give our expert staff a call or complete the form below. No job is too big or too small for the team at Source Industrial to handle. We value all of our customers equally regardless of whether they're a Fortune 500 company or a local shop. 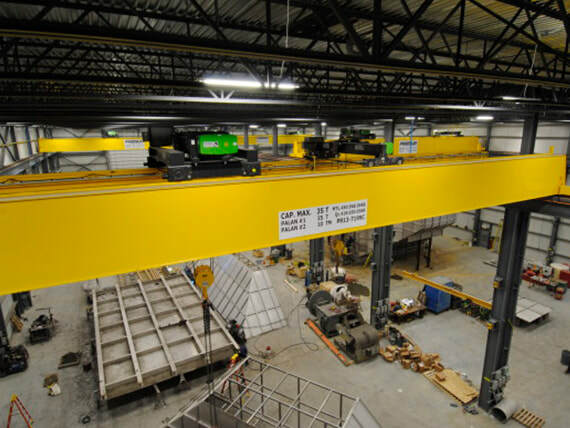 Is your company in search of a new overhead crane to help make your material handling process more efficient? Do you find that you’re stuck in a building that isn’t quite making the best use of the design? Or do you have a fully functioning facility that needs the attention of an experienced service team? The professionals at Source Industrial can assist your business with all of the above mentioned and it doesn’t stop there. We’ve turned our company into a multifaceted organization in order to provide YOU the end user with proven cutting-edge solutions for all of your lifting and material handling needs. Our crane hoist company can provide 24 hour service, maintenance, installations, annual inspections, intensive safety and operational training programs, non-destructive testing, full scope engineering services, multiple manufacturing facilities for the latest in hoisting equipment, overhead bridge cranes, gantry cranes, jibs, monorail systems, transfer carts, lift tables, and much much more. 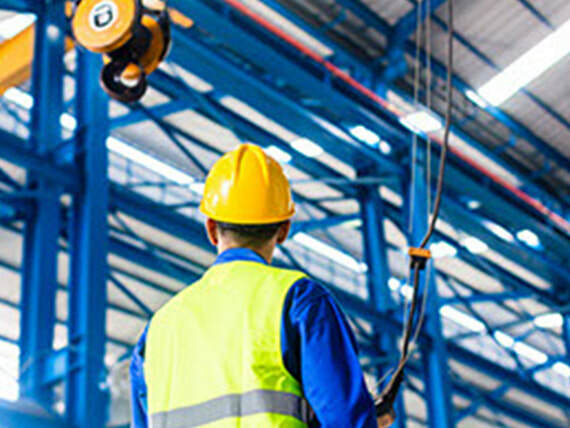 Through efficient inspection and maintenance of your material handling equipment you can increase both the safety level in your workplace as well as the longevity of the equipment. Be sure to reach out to our friendly and experienced service team today by giving us a call or completing the contact form above. 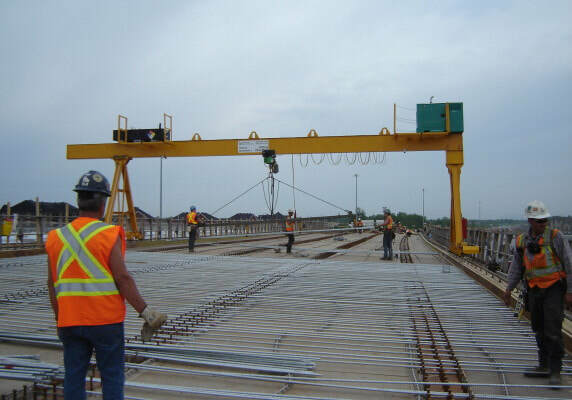 We offer top rated crane service Toronto based companies rely on for quick and safe crane maintenance. Through creative design, engineering and the understanding of your unique production process, we are able to customize, manufacture, and install a material handling solution that will benefit your workplace. 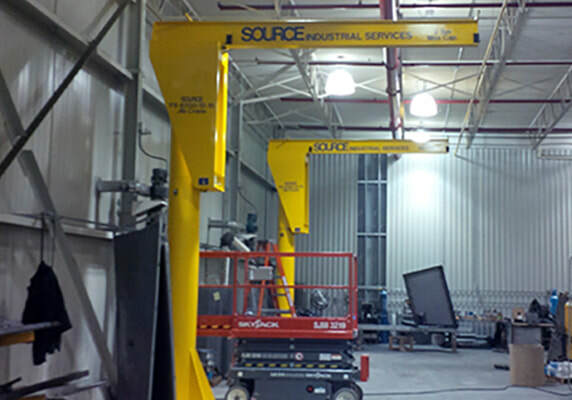 ​Source Industrial Services will design and build a custom engineered overhead crane system to suit any company specific need. Our overhead travelling cranes are available in a wide range of capacities. Top running and under hanging configuration available to suit your product or company specific requirement. Available in single or multiple trolley configurations. Pendant or Radio remote controls are also available on all overhead shop cranes. Also known as and referred to as self supported bridge cranes. The answer to your lifting needs, when head space in your building is a problem. They are also indispensable with new buildings today that are designed with long unsupported spans. 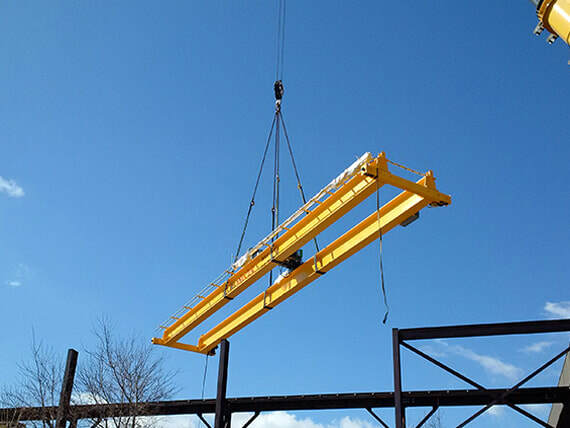 This makes gantry hoist cranes a reliable and economical solution as it travels on the building floor eliminating the need for concrete foundations, runway columns, and beam structures that are costly and eliminate much sought after floor space. The jib cranes that we manufacture are available in both wall mounted or floor mounted configurations depending on your specific application and requirements. Capacities can range from 100 pounds up to several tons. Trolleys can be manual or powered and they're available with either leaf chain, roller chain, link chain or wire rope overhead hoists. Our rugged jib crane Canada corporations rely on has boom options that range from zero to 360 degree rotation to suit custom applications or work environments. Booms are also available in manually operated or powered depending on the specific design of the jib cranes Ontario customers require. Monorail systems typically consist of one stationary beam with a single cable hoist and trolley. Due to the lightweight design, they can effectively move products from one location to another rapidly with ease. 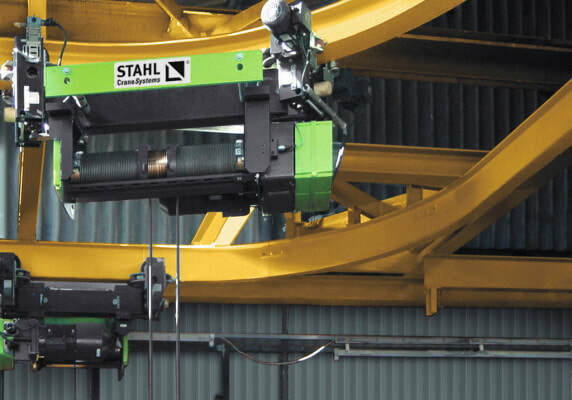 Being one of the top crane suppliers we can customize a system with a multitude of straight or curved tracks, multiple switches, interlocks or end stops as required for your needs to maximize the efficiency of your production requirements. 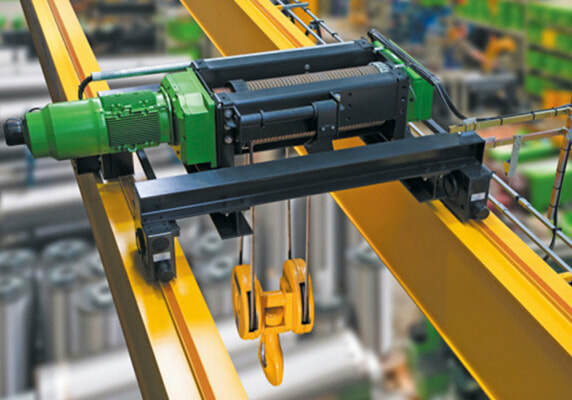 Not only do we manufacture overhead cranes Ontario companies depend on; we also supply below-the-hook lifting devices that can be designed and manufactured as structural and mechanical lifting devices, vacuum lifting devices, close-proximity-operated magnets, remote-operated magnets. At Source Industrial Services we offer custom designed below the hook lifting attachments, that are built specifically to suit your lifting requirements. Lift tables are in use throughout Canada for machine feeding, assembly, work positioning, order picking, pallet loading, and a wide range of other applications. We offer lift tables in many basic sizes to lift and position loads. A wide range of power options, controls, tabletops, and base configurations can be specified for each of the tables giving you an almost unlimited choice of variations. A custom designed transfer cart can be the perfect addition to your existing material handling process. We take an in-depth look into your company’s process and can design a solution for moving material or finished products across the plant floor. A die transfer cart or any other type can save your company a great deal of time resulting in more profitable system. Take a look at our products page for more information. forklift training? If so we have a forklift training centre and staff dedicated to putting on training courses for your employees. 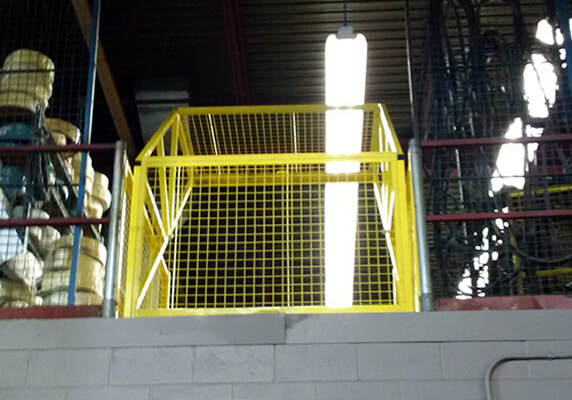 We engineer and design solutions for your particular fall protection application. We offer a thorough assessment of the fall hazards in your facility. We then familiarize you with the wide range of options available before recommending the most cost-effective, OHSA / CSA-certified and user-friendly system to meet your requirements. 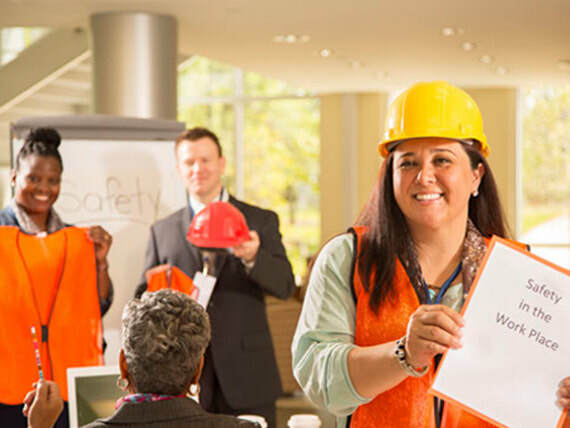 All of our systems are designed to meet or exceed todays rigorous health & safety legislative requirements and standards. 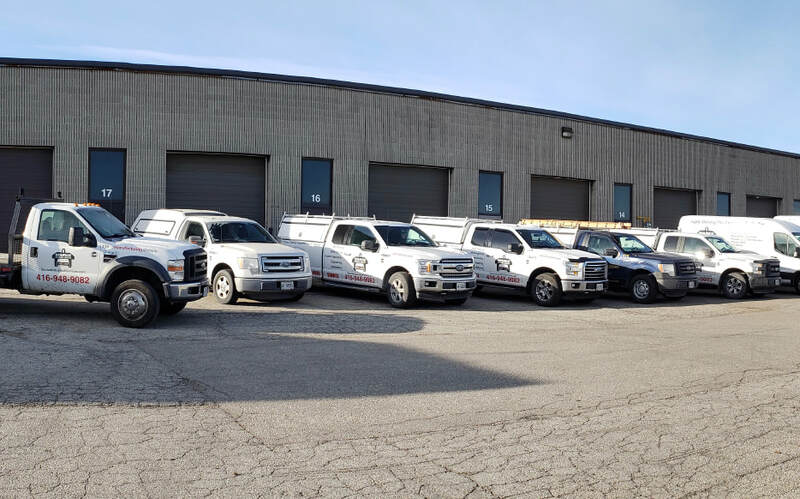 From Installation to Certification, and Servicing, we can help you to manage all of your fall protection needs including but not limited too ladder climbing, truck and trailer loading, roof systems, engineered anchor points. We offer an array of various programs that were created for different experience levels. 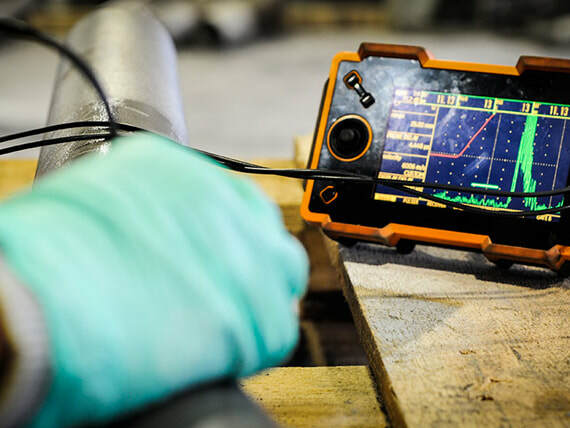 Maintaining continuous training for service technicians ensures that the equipment has been given the best attention while applying the latest in applicable technology and governing standards. 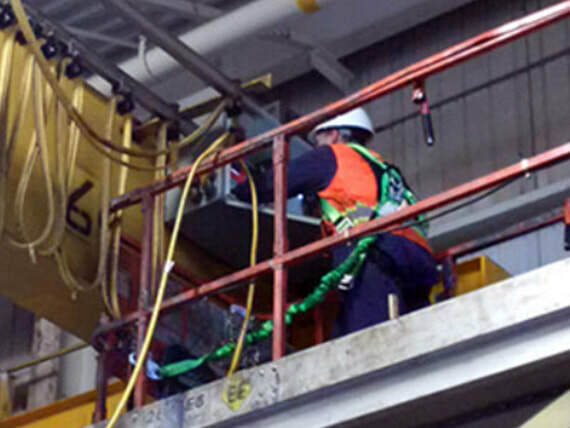 Our experts provide overhead crane training Ontario employers require in order to stay compliant with current laws and regulations.